Today's Outfit of the Day is one I wore to my friend's wedding recently. The wedding was Victorian-themed, and even though my outfit is pretty modern with a black sequin peplum dress, I channeled the classic "little black dress" and red lipstick! 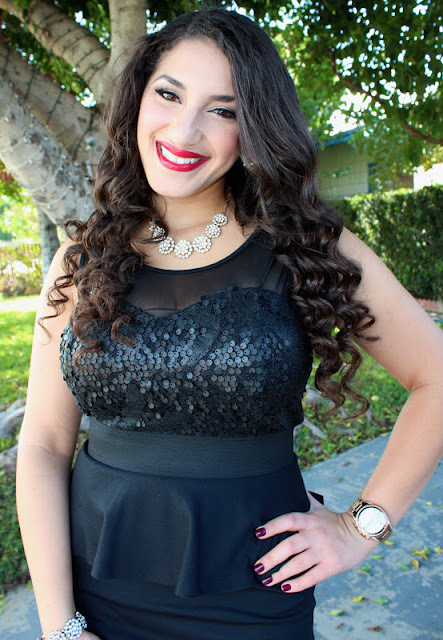 I absolutely love this black peplum dress! I think the peplum style is very flattering on many body types, and I adore that this dress has a sweetheart neckline and a sequined bust. The sequins just add so much edge to an otherwise simple black dress. I also like that the mesh makes this a more conservative sleeveless dress instead of a short, strapless dress, which would just be too revealing to be tasteful at a wedding. This dress has an exposed silver zipper and also bands at the waist for an even more flattering fit. I kept my hair in looser curls, which has been my signature hairstyle lately. It takes me less time than completely straightening my curly hair, and it keeps a nice amount of volume and body in it versus having completely straight strands. The accessories I wore all had some sparkle to them because weddings are a great excuse to get all glamm-ed up! I'm wearing a matching flower rhinestone necklace and bracelet that I usually pull out for special occasions. I'm also wearing floral rhinestone dangly earrings and my staple rose gold Michael Kors watch. I was worried that the statement necklace would clash with the sequin bust of the dress, but I think the varying colors made it more aesthetically pleasing. For shoes, I wore lacely black pumps with a feminine floral detail. For makeup, I went for an amped up neutral eye using the original Naked palette, soft pink cheeks, and the statement red lip. I also used some falsies for a bold lash line.